Click on the image to be taken to a full size map of the roads closed. The annual Newport Half Marathon takes place this weekend. There are road closures throughout the city to facilitate the event. 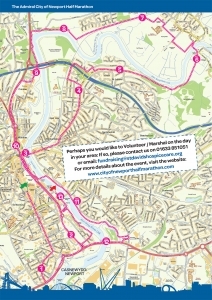 A map of the route is available on the Newport Half marathon website. It is advised that it may take longer than expected to get to the various Mass stations on Sunday, and priests may be delayed in arriving. Further information, as well as roads affected can be found on the South Wales Argus website, or by clicking here.